Happy Monday, Noshers! How was your weekend? Mine included some frozen yogurt, trying out some new veggies, and teaching my older sister how to ride a bike (I didn’t realize that she had never learned and was wondering why it didn’t come back to her, like, you know “riding a bike”). 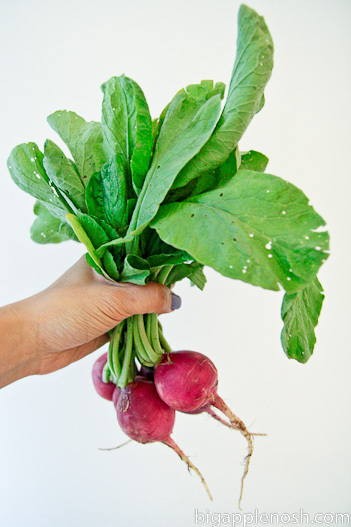 I thought I’d ease into the week with a simple Veggie Resolution post – radishes! I find radishes, like beets, particularly satisfying whenever they show up in my CSA pick-up. With the abundance of leaves and dirt still hanging onto the roots, I really feel the earthiness of these veggies – well, as much as a city girl can feel earthiness I guess ;). How do you prepare radishes? I usually just eat radishes plain, sprinkled with salt. I’ve heard you can roast them, i’d love to try it sometime! I totally dig radishes! I’ll usually put them on salads, or in soups for a little sharp crispness to the soup–don’t cook them down too much! They’re also good in salsas & bruschetta! I’ll admit that I usually push the radishes off my side salad but yours look so pretty! Maybe I’ll give them another try. Yum! I never thought of preparing radishes this way. I usually just slice them up and toss them into a salad. Thanks for the idea! I’ve heard of folks baking radish chips + dusting them with cinnamon sugar. Haven’t yet tried them that way, though. Yum!! That looks so delicious. I’m impressed that we’re up to #12!! 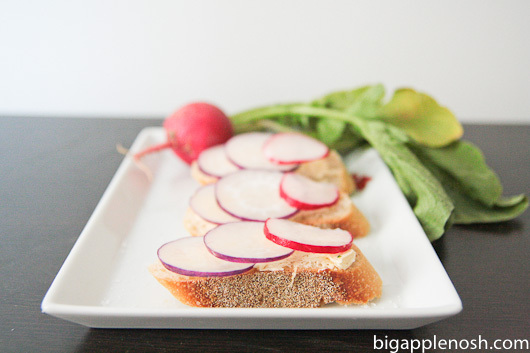 Radishes are so great, but I can’t keep them around the house — I just eat them all! Simply sliced with salt is my favorite. I’ve never had radishes in such a simple way! Sliced? On toast? YUM. That’s very healthy. I love salad but have not thought of these little radishes. I must go and get some to add to my salad. Thanks very much for sharing. I’ve never really been a fan, but you make them sound so much better than I remember! Radishes are so pretty, but I’ve never been able to get over the taste!